Maria, usually talks about herself sparingly, because she prefers to talk about others. She paints and writes books, and talks about her colleagues enthusiastically. And yet, I still asked the artist to say a few words about herself. "I was born and raised in Russia, in Moscow, in my mother’s homeland, but I was only introduced to Cuba, my father’s birthplace, when I was 22,” Maria shared with me. “I learned Spanish and now I speak it as freely as Russian. But in fact, sometimes I think I knew Cuba before then. It's an inexplicable, intuitive and instinctive feeling. To be honest, Moscow and Havana have somehow merged for me into one place, inseparable..."
"So how can you explain how the children of mixed Russian-Cuban marriages, popularly known quite rudely as "half-castes” deal with their situation? I ask Maria. And she answers also quite honestly: "This is, in my opinion, an incongruous combination... a kind of breaking of stereotypes and usual practices, concepts, habits, and lifestyle. This is a collapse of everything you can name! To simply put the whole essence of this phenomenon in a single phrase: the mother is Russian, the father is Cuban. Of course occasionally, it is vice versa, but much less often. What is most interesting is that in Russia I was always considered a Cuban woman. This is because of my appearance. Yet when I came to Cuba I was instantly," Russian". How can you deal with that if you're also an artist? For example, what's your style, what direction are you going in? How can you classify it? I have met with similar artists in Havana. Only I live in Moscow, and they are in Cuba. All of them are very different: they have different destinies; they were brought up in different countries. They have absorbed varying degrees of both cultures: they see Cuba from Russia, and they see Russia from Cuba… "
So, according to information sources close to the artist, Maria Santiagovna Valdez Odriosola was born in Moscow in 1979. Maria graduated from the graphic-art faculty of the Moscow State Pedagogical University and post graduated from the M.A. Sholokhov Moscow State Open Pedagogical University. She is a member of the "Union of Russian Artists,” and regularly exhibits her works of art in the exhibition center of the Moscow branch of the Union of Russian Artists, and the Moscow Museum of Modern Art. She has participated in numerous group exhibitions. Her solo exhibitions have been held at the Cuban Embassy in Moscow and other very prestigious arenas in Moscow and Havana. Russian artist Julia Romanova says about Maria Valdez: she began painting Cuba, looking at it from a Russian perspective, where she was born and lived with her mother. The time came when her genes and intuition started to talk to the artist. Then she started to visit her father’s homeland, who unfortunately, had already passed away. Every visit to the island enriched her impressions. Maria has come to know and fall in love with the nature of Cuba and the people of the Island. Her landscapes began to be dominated by the most vivid and impressive colors: yellow-green, red, and ocher tones. It is they that make up the harmony of Cuban plants and the sun. The companionship of Havana artists allowed her to feel not only a Russian, but also a Cuban artist. It is curious that there remains a strong interest in Cuban art in Russia. There is also a similar interest in Cuba in classical and contemporary Russian art. Obviously I would like to see both sides pay more attention to the mutual needs of the two friendly nations. Although from time to time, Russia occasionally holds Cuban culture days, just as in Cuba, days are held for Russian culture, and exhibitions, conferences and exchanges of delegations are also held. But, as always, we would like to see this happen more and more often. Visitors to the Maria Valdez exhibition at the Phoenix Hall kept telling me the same thing, in the place which graciously offered its space for the paintings of the Moscow artist with the Cuban looks. According to Julia Romanova, who knows the art of the painter very well, the landscapes Maria produced before she began to travel to Cuba were produced in an intuitive way. This method helps her to show her inner feelings, her attitudes to herself, and to her origins. So realizing that her genetic memory had started speaking to her, Maria was able to create images that are formed at the level of her subconscious. And once in Cuba, the artist began to work in the open air, to paint from real life. And she saw that her intuition was correct. After all, much of her early work about Cuba she actually created in Russia, using her literary, photographic and "cinematic" views of her father's home country! ... Russian- Cuban or Cuban-Russian? My old friend from Havana, journalist Cesar Gomez, has also asked himself this question. "This young Moscow artist is a product of two cultures. Her paintings are a mixture of colors, styles and nostalgia," he said to me, sharing his impressions about Maria’s work. By the way, Maria’s "Cuban Story" began back in 1998 when she had painted a landscape in a studio, and her teacher, who once did his military service in Cuba, said: "This is not a Russian landscape, it’s Cuban." But he did not know that his pupil was the daughter of Cuban, who at that time had never been to Cuba, her father’s birthplace. So this landscape was a call from her blood. Only after her first trip to the island did Maria become seriously fascinated by the Cuban theme. Her first painting on the theme of her second, tropical homeland that she painted when she was there, by chance hangs today in the Cuban Embassy in El Salvador. Maria has to her account dozens of solo exhibitions and participations in collective exhibitions. 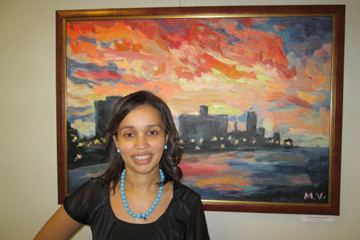 Her paintings have been exhibited not only in the Cuban Embassy in Moscow, but also in the State Duma, the Ministry of Culture of Russia, the Russian state and national libraries, and in the Legislative Assembly of St. Petersburg. Also her paintings are now well known to the people of Havana. They have been successfully presented at the Jose Marti International Institute of Journalism, at the “Yar” Cultural Center, and in Havana's Center for the Development of Fine Arts. The artist has been awarded with diplomas for her international cultural activities, including in Russia and Ecuador. Maria has written about a dozen books on art. Three of them are devoted to the topic of art as therapy. The publisher "Klooch-S" is preparing to publish her work on children, who like herself, have two homelands, as well as on Russian artists living in Cuba. It makes Maria a "colorful" ambassador for both states: Russia and Cuba. She considers both as home. The genetic, intuitive memory of the artist is constantly making itself felt. This most clearly manifested itself in Maria’s exhibition on the theme "This is my Havana." Maria shared her secret feelings with me. "Sometimes it seems to me that I have two separate lives and that two people live in parallel inside of me. In Russia I am one, I, and in Cuba another. But I know very well how the people in these two countries live and think. All of this is reflected in my art work. " This is how she is ..., the Moscow-Havana artist Maria Santiagovna Valdez. It never occurred to her that she would voluntarily or involuntarily be engaged in cultural diplomacy, bringing together the artistic (and human) worlds of Russia and Cuba. In this way she understands herself and these worlds, using her sharp perception of the spaces surrounding us and a rich palette of the colors of life. I salute you, Maria! I wish you well and success with your art! 419: 30 seconds to mars. «Intuitive Havana», by Maria Valdez3 June 2013: «Intuitive Havana», by Maria Valdez! лучшие комедии. «Intuitive Havana», by Maria Valdez.